From left to right: Corina S. Pǎsǎreanu, Sebastian Elbaum, Suzette Person, Matthew Dwyer, and Gary Leavens. 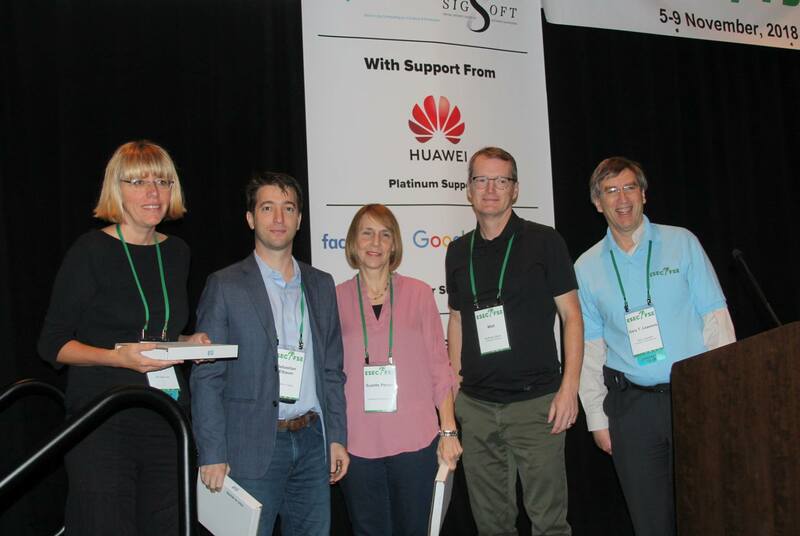 In 2018, the ACM Joint European Software Engineering Conference and Symposium on the Foundations of Software Engineering (ESEC/FSE) steering committee has installed a Test of Time Award. The Test of Time Award is given annually recognizing highly influential papers published ten years ago in ESEC or FSE. This year, awarded papers included "Differential Symbolic Execution," which was co-authored by CSE Associate Professor of Practice Suzette Person, along with former CSE faculty and current University of Virginia professors Matthew Dwyer and Sebastian Elbaum, and Corina S. Pǎsǎreanu of the NASA Ames Research Center. ESEC/FSE is an internationally renowned forum for researchers, practitioners, and educators to present and discuss the most recent innovations, trends, experiences, and challenges in the field of software engineering. ESEC/FSE brings together experts from academia and industry to exchange the latest research results and trends as well as their practical application in all areas of software engineering. Congratulations on this excellent achievement!